1995 PB Arabian mare, small but very athletic and loves attention! Kandi is currently being leased by Marsha during the winter months! 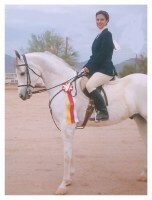 1988 PB Arabian mare (daughter above) who has done it all -- hunter, western, dressage, driving, trail riding. Extremely athletic and has been shown in Class A shows (on a limited basis). Always in Top 5. Needs an experienced rider. Western Pleasure, Hunter Pleasure, Driving and could do Dressage.